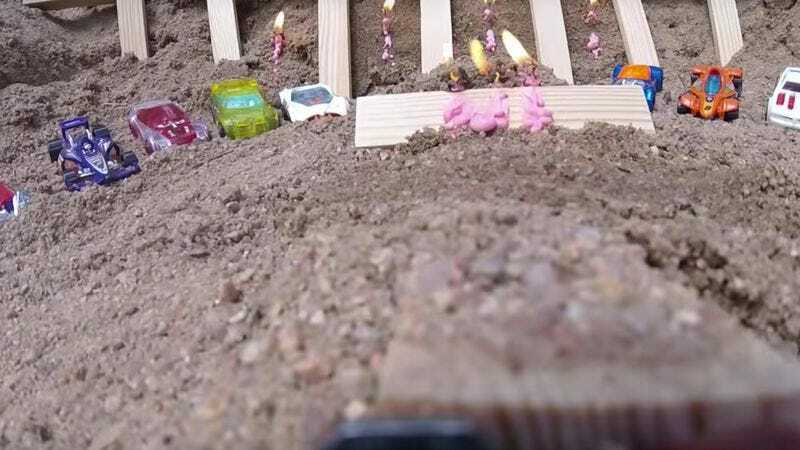 Back in April, we wrote about a fun video where some guys called 5 Mad Movie Makers put together a big Hot Wheels track on a beach and then attached cameras to the little cars so viewers could experience it in a first-person view. That was cool at the time, but now it’s August. Our tastes have matured, and a simple video of Hot Wheels cars on a beach isn’t going to satisfy our need for (tiny) speed any longer. Thankfully, the team behind the beach track is back with a new Hot Wheels video, and this one literally blows the other one out of the water—well, not literally, but it does feature a bit where the car goes underwater that is super cool. As you can see, there are a few edits in the transition from one section to the next, but the makers say everything from tunnel to tunnel worked just fine on its own and the car was “powered entirely by gravity at all times.” All told, the road trip required “about 200 feet of track,” and—unsurprisingly—the underwater section sounds like it was the most difficult. Don’t act like that would dissuade you from trying it yourself, though.